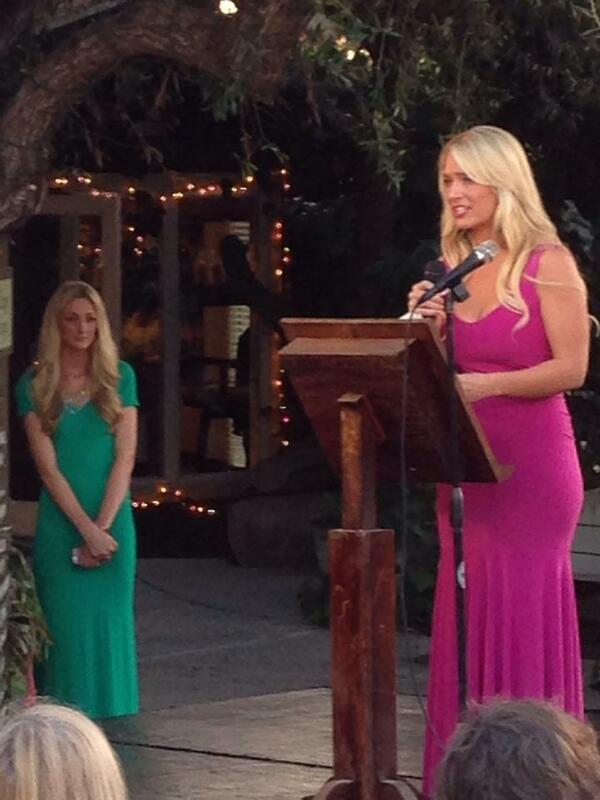 Earlier this week, I had the honor and privilege of speaking at kickoff night of San Diego Women’s Week. It was such a special night for me and it excited and ignited me in ways I didn’t know were possible. My dad had hoped he would be able to attend the event — but, (without trying to sound too cliché) I know he was there, surrounding me and encouraging me as he’s always done. So, here’s my speech from Monday night. The whole process was truly cathartic for me, and I hope it touches you in some way too. This moment that I’m in is so bittersweet. It’s also ironic, because I’m here tonight, living out my dreams, the opening speaker at San Diego Women’s Week, surrounded by brilliant, creative and dynamic women…all because of a man. But not just any man…the most important man in my life, my dad. My dad was magical. He was an author, organic gardener, 5-time Emmy award winning journalist and by far the funniest man I’ve ever known. My dad became a local legend, and rightfully so. He dedicated his life to bettering San Diego from the coast to the mountains. He was the most handsome bald man you’d ever seen, with seafoam blue/green eyes, a wide gap between his front two teeth and a year-round tan from afternoons spent working in the garden. And there was that voice. One news director described the sound of my dad’s voice as “a warm blanket”…and it was. My dad, with his endearing gap-toothed grin and his deep, soothing voice, graced San Diego airwaves as a T.V. reporter, weatherman and anchor, 5 nights a week for 30 years…that was all until Friday, January 25th, 2013. That night, my dad signed off the same way he usually did: “Thanks for watching everybody, 2 ½ Men is next.” Nobody knew it at the time, but that would be his final TV sign off. On Sunday night, we rushed my dad down to the ER for some stroke-like symptoms. I remember feeling like I was living my worst nightmare. Being 23 years old, I knew I wasn’t ready to lose my dad. By Monday, an MRI revealed what endangered every happiness I’d ever known, a lemon-sized tumor in my dad’s brain. He nicknamed it “the blob” and Surgery was scheduled for later that week. My mom and I did a ton of Googling, studying up on brain tumors, surgeries, the risks and side effects. The more we Googled, the more terrified I became. And until now, I never really comprehended how my mom must’ve felt… she knew a lot more than us kids. My parents were married on April 4th, 1987. More out of necessity than nostalgia, they had a quiet little ceremony at my mom’s childhood home in North County, San Diego, her own mom in a hospital bed in the living room, on hospice with terminal brain cancer. My grandma, Phyllis Jane, passed away just 2 days after the wedding. She was only 43 years old. My mom was 23. Our brains are, quite literally, our hard drives, so it goes without saying that there are a ton of risks that go along with brain surgery, some of which can lead to some pretty bizarre side effects. We read that in some cases, after undergoing neurosurgery, patients woke up violently swearing, while others lost their speech entirely. In a few rare cases, patients woke up with something called “foreign accent syndrome,” which is exactly what it sounds like. When my dad heard this, he joked that he was requesting an English accent. My dad’s “blob” was located in his left frontal lobe. The frontal lobe is said to control the “essence of humanity” including our ability to feel sympathy, empathy and our ability to understand humor, sarcasm, word-plays. The left lobe, in particular, controls logic, language and, most importantly, speech. Essentially, this “blob” was threatening to take away everything that made my dad…my dad. He called it poetic justice. I couldn’t even pretend to see the justice in it. My dad went in for surgery on January 31st. The surgeon planned to remove as much of the brain tumor as he could, and determine if it was benign or malignant. If it was malignant, he could have as little as 6 months left. I remember the sound of my mom sobbing. After that, everything went black. My dad lived exactly 11 months after the diagnosis. And I was lucky enough to spend all 11 months right by his side, doing my best to absorb every ounce of him. My entire life, my dad had been my mentor. I was following in his footsteps, working towards a career in journalism, as he trained me on and off camera, for T.V. news. But it was our love of words that really bonded us. And my dad’s greatest gift to me, was the gift of writing. When he got sick, our relationship with words, and with one another, took on a much greater significance. From his hospital bed we started a blog we called “The Nancarrow Project,” where we adopted a policy of transparency and shared everything as it happened. My dad lost the use of his right hand early on, so I became his hands, typing as his dictated, more eloquently than ever. As writers, words are our therapy, and with each post, a flood of support would follow as others also shared stories of love and loss, reassuring us that we are not alone. Each comment felt like a bear hug…and my dad hugged back, writing more than 50 blog posts in those 11 short months, garnering more than 20-thousand followers and nearly one million blog views. In February, my dad’s first lesson, was a lesson of laughter. He’d been busting guts for 59 years but, in the face of terminal cancer, I wasn’t sure if he’d retain his sense of humor…and I wouldn’t have blamed him if he hadn’t. But, just hours into his diagnosis, it became obvious that humor was one aspect of his personality that wouldn’t stay the same, it would become literally larger than life. A few days later he was released from the hospital, aware of his predicted “expiration date” (as he called it) and he had big plans. First up, on the way home, before anything else, he wanted a manicure (I told you he wasn’t just any man). He left the nail salon that day, not just manicured, but also with a fresh glossy coat of cobalt blue nail polish. In March, my dad taught me his 2nd lesson…adventure. Suddenly, life had become time-sensitive, so he went out and lived it with curiosity, fascination and excitement. He told me he was “obsessed with having a good time.” My dad wasn’t allowed to drive because of seizures, but that was lucky for me because it meant that I was guaranteed an invitation to almost every fun activity, even if only as a chauffer. We went camping and built bonfires, we designed centerpieces and adopted a puppy, we harvested honey from a beehive, planted organic gardens and got lots and lots of mani/pedis. During that time, my dad was childlike with wonderment, and he just radiated positivity and joy. My dad spent July preparing for a big acceptance speech, hopped up on steroids to keep the brain swelling down. He wasn’t much for awards. In fact, he threw away all five of his Emmys. But, I don’t think he’d mind me telling you that he was moved to tears when he learned he was being awarded 2013 Journalist of the Year by his peers at the Society of Professional Journalists. It had been a rough few weeks leading up to his speech, and we all held our breath as he walked up to the microphone, sporting a brand-new, custom-tailored suit and what he called his “Bond villain scar” across his still perfectly-tanned bald head. Without a script or even a note card, my dad delivered the most beautifully written speech I’d ever heard. The audience left that night feeling a sense of hope, never believing a man, so eloquent and tenacious, could possibly be dying of brain cancer. In September, my dad taught me lesson number 5…altruism. Back in the hospital after an array of complications, my dad spent almost 3 weeks in intensive care. Surgeries, sutures, IVs and the continuous sounds of beeping, buzzing and moaning flooded our senses. But my dad was never the kind of guy to throw a pity party, instead, he helped my mom throw a birthday party. I turned 24 on September 15th. My mom stayed up all night decorating the ICU with glittery, hand-painted posters and we “celebrated” with old pictures and memories of easier days. And, even in his dire circumstances, my dad couldn’t help but think of others. In the Fall, my dad’s 6th lesson, was a lesson of gratitude. By October, he was having a more difficult time getting around, his breathing had become more labored and he had made the decision to stop treatment. Hospice came on board and the living room was transformed into a hospital room, packed wall-to-wall with a medical bed and an oxygen tank, a wheelchair, a walker and a cane my dad referred to as a “walking stick.” And as we moved into November, our usual holiday decorations were displaced by hoards of latex gloves, pill bottles, syringes, and more gauze than I’d ever seen. You’d suspect that, by this time, anybody else would’ve lost their grit…but not my dad. Loren was a renaissance man, a guys’ guy who was as similar to Bear Grylls, as he was to Martha Stewart. A man who loved getting his hands dirty, as much as he loved arranging a centerpiece. He liked making homemade peanut butter and candles, vanilla extract, beef stroganoff…and did I mention centerpieces? My dad was a kayaker, an organic gardening guru and a lover of wonderment. He enjoyed Bob Dylan, Jack Daniel’s and hot sake and was an avid collector of walking sticks, beach glass and beautiful german shepherds. My dad knew everything there was to know about citrus trees and roses and tomatoes, raising chickens and earthworms and monarch butterflies. He was a human Pinterest board. Loren Nancarrow will be remembered as liberal but open-minded, firm but kind, intellectual but hysterical. And he won’t mind me saying, he was a quiet but strong supporter of medical marijuana. He was proud to be San Diego’s Organic Son. It’s been almost 3 months since I lost my dad. When people ask me how I’m holding up, I always smile and tell them “I’m doing really well.” Some people look at me with disbelief, as if they suspect I’m putting on a great big, joyful front to disguise my pain. Others look at me as if I’m cold for feeling happy so soon after losing my dad. But the truth is, I am happy. I feel happy to have known him, I feel happy to have loved him and I feel happy to have his DNA running through my veins every moment of every day. In those terrifying and harrowing 11 months, my dad and I spent almost all our time together just being happy. We cooked elaborate meals and cared for the roses, we read Dr. Seuss books and trimmed bonsai trees, we listened to music and discussed literature and, towards the end, we pondered what lies beyond this life. And, my dad’s eighth and final earthly lesson, was a lesson of faith. He taught me to have faith in something more than I can see with my eyes. He taught me to have faith in signs and in energy. He taught me to have faith that we’d see one another again. While my dad was dying, he taught me the eight lessons I needed to truly live. And living was something my dad had mastered…because his life, was a life well-lived. Because of him, I know laughter and resiliency, adventure and passion, altruism, gratitude, peace and faith. And it goes without saying that, because of him and because of my beautiful and magnanimous mom, I know love. Real, unconditional, everlasting love. So, thank you for allowing me to stand up here to talk about a man, on a night so deservedly dedicated to women. I wish my dad could’ve been here, in the flesh, tonight. He wanted to be and would’ve been honored to be surrounded by a group as impressive as you, although he’d also be totally fed up with all the crying. You see, at work and at home, my dad spent most of his time surrounded by women and he could chat it up with the best of us, but even he had his girl-time limits. Hannah Jane Nancarrow is a San Diego State University alumni, with a B.A. in journalism and new media. After graduating in 2011, Hannah worked in local T.V. news before her dad was diagnosed with terminal brain cancer. Hannah managed and contributed to her dad’s incredibly popular blog (thenancarrowproject.com) and social media platforms before he passed away, after 11 months of bravely battling and blogging. The diagnosis was a catalyst for her own writing and for following each whim and dream. Today, Hannah writes her own blog and has been a keynote speaker at San Diego Women's Week, Relay for Life, and a top fundraiser for cancer-related causes throughout San Diego. Hannah also has a passion for health and fitness, since losing 75 pounds in 2011. She earned her Spinning® and group fitness instructor certifications, and teaches weekly cycle classes in Encinitas, California. Hannah also earned her real estate license and works in the family business, Nancarrow Realty Group, in North County San Diego. Tagged with: blog, Brain Cancer, Britta Nancarrow, Cancer, Graham Nancarrow, hannah jane nancarrow, hannah nancarrow, inspiration, Loren Nancarrow, Nancarrow, San Diego, san diego women's week, sd women's week 2014, Susie Nancarrow, terminal, Tumor, wow! what a ride! Wow! This was so beautiful. Thank you for sharing so truly and with such raw emotion. I am crying, tears streaming freely down past my cheeks onto the computer keyboard. We are community, Loren was familiar in our home solely by his being on television. But somehow his spirit came through and you knew he was a great man. Thank you Hannah for sharing his beautiful legacy, and the grace in which he faced his last days. What a gift to you to be able to be by his side. Thank you Hannah. I had to read this in 2 increments because of my tears! Good tears. Missing him tears. And I love the final quote. I live by that and have a plaque with that saying on my wall. And yes… you two will see each other again. Of that I’m sure. Thank you again for sharing. Wow…great talk with lessons for all of us! Beautiful speech! You’re a rock star and your Dad would be proud. Hannah that was moving and authentic and true to your core. That is the greatest gift you can give anyone. So proud of you!! You are awesome!!! Just like your Dad. You are a remarkable young woman. Thank you for sharing and continuing to share. Your dad has left a wonderful legacy! Hannah, your dad (and mom) must be so proud of you!!! I loved the speech. What an informative, thought-provoking, and touching speech, Hannah! Loving and being there with your Dad, a San Diego treasure beyond comparison, was such an amazing gift between parent and child AND, with us — San Diegans who had come to love this man on the screen with all his knowledge, ease, and genuineness. Pax et bonum. What a wonderful speech and perfect tribute to your dad. You have a great future ahead of you and your dad is proudly watching over you. I am also very proud of you and your family. What a wonderful tribute to your wonderful dad…lessons we all can learn from….thank you! I don’t believe you dad would be proud of you, I believe he IS proud of you and your family for carrying on. You are an inspiration as he was and he is watching over you. He was at peace, so you are able to be at peace with is passing. But, he is still here in the things you do. Thanks so much to him and to you and your family for sharing him with us. What a wonderful speech! Loved your Dad. He remains with us here – through you. Wonderful Speech!! Very moving. Your dad would be so proud of you!! I really thing your speech and writings help alot of people. Thanks for sharing Hannah! Pam, please read below, top to bottom. What a wonderfully told story. You’re brilliant like your dad. You’ re awesome and amazing daughter and writer! Pretty good thought you might want to read when you have time it’s pretty long. I read this speech when you posted it and I just reread it again. I Love Everything about it. So. Incredibly. Moving. AND. inspirational. Thank you Hannah! Thank you Kristina! Miss you and love watching your beautiful family grow!